The horizontal movement of the piston is converted to rotate a central wheel. 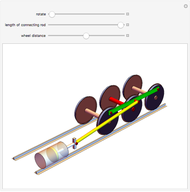 Two other wheels are driven by a horizontal link bar interconnecting the three wheels. Sándor Kabai "Steam Locomotive Drive"